Why climb Pothole Dome? It's a short hike that's long on variety. The top of Pothole Dome offers rewarding views looking east across Tuolumne Meadows; the lower section of the hike traverses a series of cascades in the Tuolumne River; and the last section of the loop skirts the western edge of Tuolumne Meadow with views of the surrounding mountains reflected in pools in the Tuolumne. Best Time to Visit: Best in the first month or so after the Tioga Road opens (usually in June), when the meadow is green and the river is high. Worth the effort anytime, though. The mosquitoes will be less of a plague in the meadow later in the year. Crowd Factor: Usually light; most visitors are romping in the meadow rather than lurking around its edges. Difficulty: Mild. Pothole Dome may tower 8,760 feet above sea level, but you get to skip the first 8,500 feet. There's not an official trail all the way up the dome, but you can find routes that aren't Half-Dome steep, and it's easy to go this entire hike without ever feeling like a misstep would put you in danger of falling far enough that you'd have time to whip out your cell phone and call your mom before the big kersplat at the bottom. The park service had sound reasons for naming it Pothole Dome instead of "Pothole Needle" or "Pothole Spire of Death". Parking: small parking lot at the very western edge of Tuolumne Meadows. The trail starts there and loops around the edge of the meadow to Pothole Dome. Here's a Google Street View panorama of the trailhead parking area. Getting There: From Yosemite Valley, take highway 120 ten miles (16.8 km) to the Crane Flat turnoff onto Tioga Road, then take Tioga Road 38 miles (61 km) east to reach the trailhead parking lot, which is just at the western edge of Tuolumne Meadows. 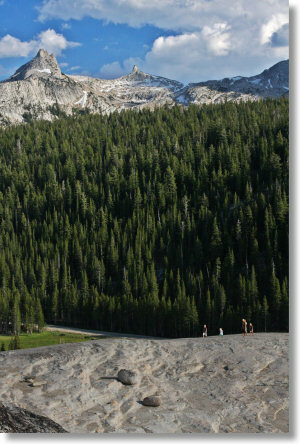 From Yosemite's east entrance at Tioga Pass, drive west 10 miles (16 km) to the trailhead. Hazards: Bring your mosquito repellent for the stretch along the river, especially the part that loops along the meadow's edge next to the river on the return trip. In fact, if you've got something more powerful than mosquito repellent - maybe some mosquito anti-matter that might work but might accidentally destroy the universe - it's probably worth trying out here.